September 21, 2016 marks the 44th year of Ferdinand Marcos’ declaration of Martial Law. I wasn’t born yet when it happened, and neither were our second graders. But that is not an excuse for us not to know the truth about our country’s dark past. Learning about our history is something that we owe ourselves and the future generations because, indeed, it will help us become better citizens and take care of our nation the best way we can. So as their Araling Panlipunan teacher, I felt that it was my duty to share what I know about Martial Law. Coincidently, we have been talking about the different places in Quezon City, including the shrines and statues commemorating important people and events in our history. The Bantayog ng mga Bayani, the People Power Monument, the EDSA Shrine, and the Ninoy Aquino Monument—a perfect opportunity for discussion. At the end of the module, my objective is not only for them to memorize the places, but for them to have a deeper understanding of why these places exist; that they are not just landmarks, but actual people and events that shaped our society. I didn’t think I’d be able to do it and walk my students through such a sensitive topic. 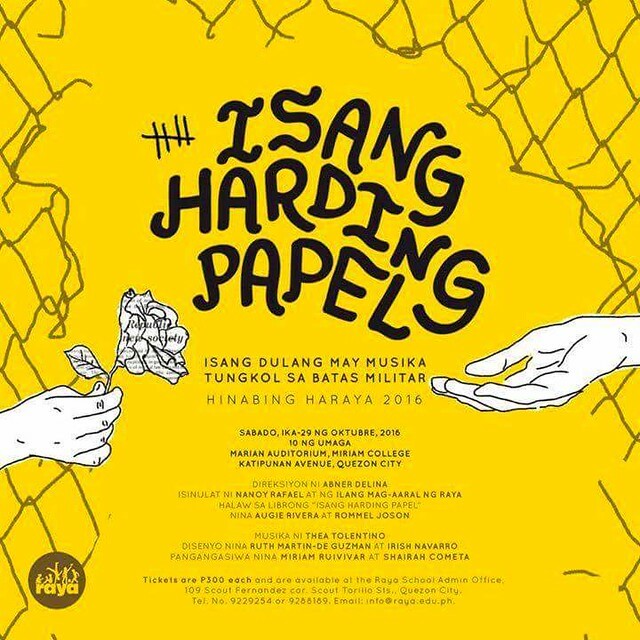 Big thanks to the storybook, Isang Harding Papel by Augie Rivera, I was able to discuss Martial Law in a serious but less violent manner. Also with the help of the recently published article in Junior Inquirer, I was able to relay information in a way that the students can easily understand (i.e. the things Filipinos couldn’t do). Grade 2-Lawin experienced a simulation through rules that prohibited them from talking, drawing, and making unnecessary noise. Anyone who disobeyed were “arrested and put to jail,” or couldn’t play. Fortunately, nobody was “put to jail.” We processed the simulation afterward and the feelings that surfaced were fear, anger, and sadness simply because they didn’t have freedom. Meanwhile, Grade 2-Dumagat was given a chance to vote. Democracy was practiced, majority won, and the simulation didn’t happen. Instead, we had a mini debate on whether Ferdinand Marcos should be buried in the Libingan ng mga Bayani or not. They had plenty of questions, and even requested to see more videos but I told them they can do that when they get older. I knew it wasn’t the right time for me to tell them everything but I was beyond grateful for the opportunity. While some of them expressed that they prefer Martial Law because it resulted to “order,” others preferred not to be under it. One of them asked if it can happen again to our country, to which I answered, “What do you think?” Full of hope, he said, “I don’t think President Duterte will ever declare Martial Law.” Like him, I am also hoping for the same thing. And with our discussion, I hope they realized that they are never too young to be involved, and that their ideas and sentiments matter. They are Filipinos and they are responsible for the future of our nation.